I did this walk on Sunday 7th November 2010. It was a cold and gloomy morning and although the weather soon brightened up it remained quite chilly all day. 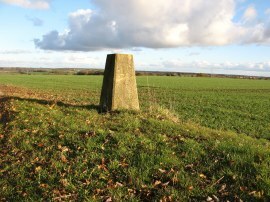 From Balsham the Harcamlow Way heads to the east before heading back round in a more south westerly direction and although not on the Harcamlow Way I used the village of Linton as my start point for this walk as it handily located between the two arms of the walk. It was also convenient to drive to and gave me a number of different options to return to depending where I finished my walk along the route. Having negotiated the one way system in Linton I parked besides the church in Church Lane. 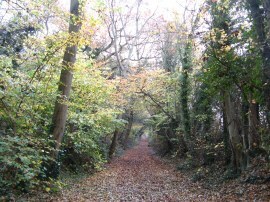 From there I set off up the lane and along a short stretch of footpath to Coles Lane. Reaching the end of Coles Lane I then headed to the right along Back Road before soon joining a bridleway on the left that starts heading uphill alongside the edge of the cemetery. At first this is a tarmac track running alongside houses but it soon heads out into the countryside, photo 1, steadily ascending all the time as the path heads up Rivey Hill. Approaching the top of the hill there were good views back to Linton, photo 2, and also over the surrounding countryside. 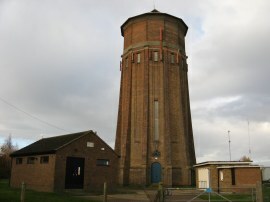 On the very top of the hill is a tall brick water tower, photo 3, a prominent landmark which I was able to keep spotting on the horizon during much of the days walk. From the water tower I joined a track that continues ahead to eventually reach the B1052 road. My route then headed along the road for a short distance past the entrance to Chilford Hall. The road was surprisingly busy with a steady stream of cars passing by, almost all of which turned into the driveway for the hall where a quilt show was advertised. Fortunately there was a grass verge besides the road, which although rather uneven did mean I was able to avoid most of the cars. Soon however I was able to join a footpath on the right that heads diagonally across one field before taking a straighter course across the middle of the next field to rejoin the route of the Roman Road that I had walked along on my return to the car at the end of my last walk along the Harcamlow Way. 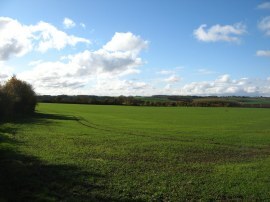 From here it was just a short walk to the right along the roman road to rejoin the route of the Harcamlow Way, photo 4. The first part of the path was much muddier than last month and at one point I passed a couple with the woman walking backwards along the path struggling to pull a pushchair through the mud. The surface of the path soon improved though as it heads out between open fields, following the roman road down to cross over a minor road. 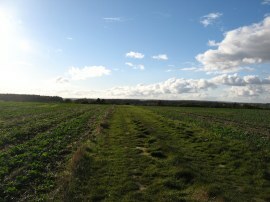 Photo 5 was taken looking back along the way I had walked, with Borley Wood in the background. 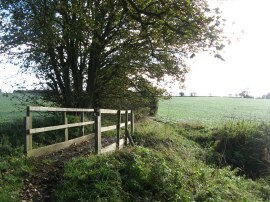 Once over the road, the route crosses over a small bridge, photo 6, before continuing on along a footpath running between fields. As the path starts heading downhill the Harcamlow Way leaves the route of the roman road to join a broad footpath on the right that snakes its way between fields alongside a drainage ditch, photo 7, as the route makes its way towards the village of Horseheath. Reaching the edge of the village the route heads between houses to reach Audley Way which is followed down to West Wickham Road. 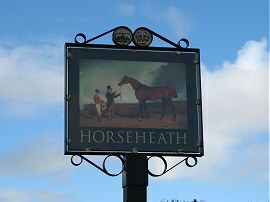 Here the route heads to the right up to a small village green with the rather unusual village sign, photo 8, which looks like a Constable painting although I can't find any connection with the village. 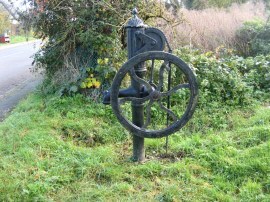 The Harcamlow Way then heads to the left along the Haverhill Road for a short distance, passing an old water pump at the roadside, photo 9, before heading to the right down Howards Lane. Almost immediately the route takes a footpath that heads through a rather overgrown hedge on the right to cut across the village cricket ground, photo 10; the entrance to the cricket pitch marking the eastern most point of the entire Harcamlow Way. There dew was still lying on the grass and I could tell from my footprints that I was the first person to walk across the path that morning. Leaving the cricket ground, the route crosses a small bridge and passes through a kissing gate to head along a small section of field to reach the rather busy A1307. Traffic was travelling quite fast along the road and I had a short wait before I could cross the road to join a footpath that continues ahead on the other side of the road, running along a field edge path from where there were yet again nice views across the surrounding countryside, photo 11. At the end of this field the route head to the left along another field edge path which leads to a small patch of trees where the route turns sharp right to join a tree lined sunken path. This soon leads out to another field edge path that runs alongside a number of fields to reach Camps Road, photo 12. 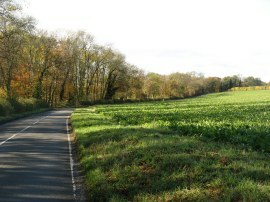 The Harcamlow Way heads to the right along the road as it makes its way towards the village of Bartlow. Luckily this road was quite quiet and despite a good half a mile of road walking I was only passed by three or four cars. 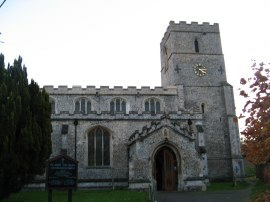 Soon after reaching the edge of the village the route heads to the left into the churchyard of St Mary's church with its unusual round tower, photo 13. 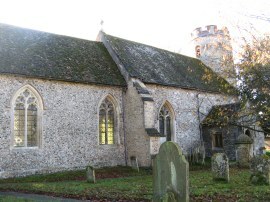 The path heads to the left besides the church to join a narrow footpath lined on the left by a tall metal fence. 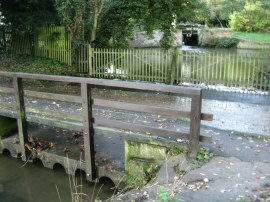 The footpath heads downhill to cross a small stream before bending round to the left to cross a footbridge over a disused railway line. Once over the railway line I was confronted by the most unusual site of two tall steep sided grass hills, one of which had a wooden staircase ascending to its narrow summit. At first I had no idea what these where and a trip up to the top of the tallest hill did little to enlighten me. 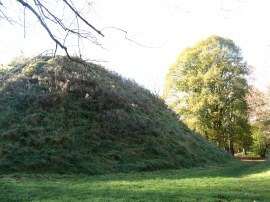 It was only when I had descended and walked round the other side of the hills that I saw the notice board explaining that they were the remains of what was once a group of seven Roman burial mounds, known as the Bartlow Hills, photos 14 and 15. 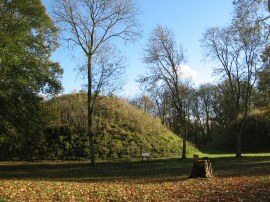 The largest burial mound is 45 feet high and 144 feet in diameter and is the highest burial mound in Britain. I had never heard of the Bartlow Hills before and these really were a completely unexpected discovery and finding them once again re-affirmed one of the main reasons why I like going out walking so much. From the tumuli the route follows a footpath that heads through trees to the Bartlow Road. 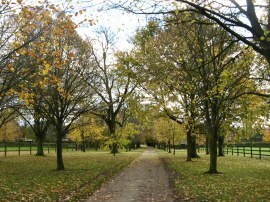 Here the Harcamlow Way heads to the left along a path running through a narrow band of woodland, running parallel with the road to reach Three Hills Farm. 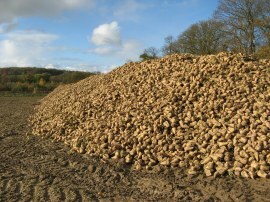 Here the route heads up the driveway and past the front of the farmhouse to reach a large open field where I was confronted by another large mound, this one comprising of a harvested sugar beet, photo 16. 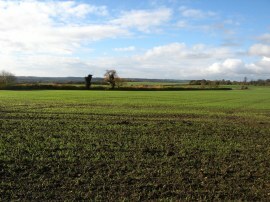 The route turns to the left, following a track that heads gently uphill running alongside the field edge. Reaching the end of the field the route heads to the right running between fields, photo 17, to reach a junction of path in a small patch of trees. Here the Harcamlow Way continues ahead on a tree lined track, photo 18, where I stopped for my lunch break, a large metal roller making a perfect bench to sit on. The track then heads down past an impressive house, fronted by an immaculately trimmed yew hedge, and some converted farm buildings to reach a road at Steventon End. Heading across the road the route crosses a stile, I think the first one I had crossed over all day to head over a small field before crossing another stile into a much larger and more open field. The route continues ahead across the middle of this field before turning to the left to reach a hedge where the route turns right again to run up to a road by Ashdon windmill, photo's 19 and 20. 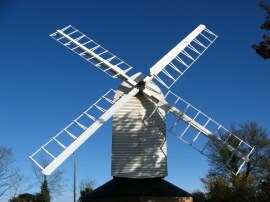 The windmill was originally built in 1757 and has recently been restored. From the windmill the route heads alongside the nearby row of cottages before joining a hedge lined path between two fields. 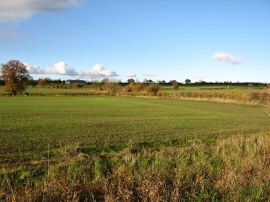 After a short distance the route joins a footpath on the right that runs along the field edge boundary in photo 21 to eventually bend round to reach Kates Lane on the edge of the village of Ashdon. It was nice to see that a couple of benches had also been placed alongside the field edge and I made use of the first of these for a little break. 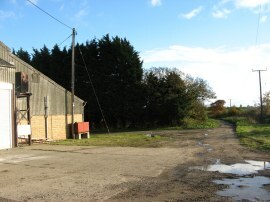 The route heads to the right along the road into Ashdon, crossing over Radwinter Road to join a footpath that runs alongside the edge of the Baptist Church car park to reach a field which the Harcamlow Way heads diagonally across to the left. The route then joins a path that heads to the right to cross a footbridge over the River Bourn before turning sharp left into another field. 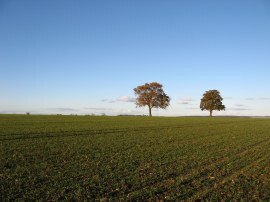 The footpath gradually heads away from the houses on the right towards the trees at the far corner of the field before heading uphill alongside the edge of the trees. 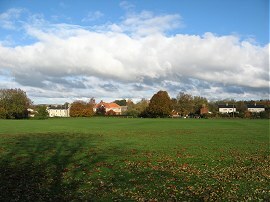 The route then bends to the left along a broad grassy path that leads to a group of houses and the Walden Road. Here the Harcamlow Way heads to the right for a short distance before turning to the left down Fallowden Lane. A couple of years ago I had done a circular walk from Saffron Walden and from this point until I left the Harcamlow Way I was walking along paths I had already walked. 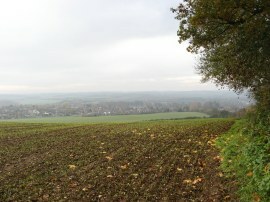 (Regrettably, although it had been a very pleasant walk I never got around to writing up the route description for it). 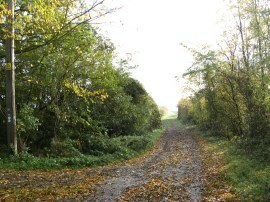 The route heads down Fallowden Lane to reach an isolated house. 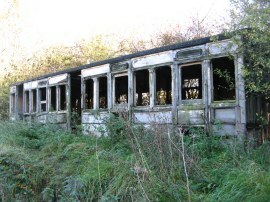 Just before the house is reached the lane crosses the course of a disused railway line where there is the remains of an old wooden railway carriage on the overgrown platform of what once was Ashdon Halt. The carriage, photo 22, was placed there in 1916 and acted as the waiting room for the station. The route bends round the back of the house at the end of Fallowden Lane before turning to the right on a track that runs past a house. On the map the footpath is shown as heading to the left through the site of the house and across the middle of the field behind it however the actual route of the path follows the track a bit further down before heading to the left along the edge of the field to reach a road, where there is a footpath marker. The Harcamlow Way then heads to the left along the road for a short distance before turning to the left along a farm track that runs besides a couple of large glasshouses. The path soon heads out over open fields, photo 23, as the route makes its way down to Butlers Farm, photo 24. Here I finished this stage of my walk along the Harcamlow Way having walked another 10.6 miles along the path. I then began making my way back to the car in Linton. Turning to my left I then joined a byway that made its way over fields, photo 25, where I saw a herd of deer. Reaching Mitchells the byway passed a pond where there were a number of ducks and also an extremely large number of doves which all took off as I approached. Turning to the right I then joined another byway that runs past the farm house and continues ahead along a broad concrete farm track which heads gently uphill to reach a trig point, photo 26. Just past the trig point I joined another broad farm track that headed off to the left between fields. I am not sure if this is a public right of way but it did provide a short cut to Nunn Wood. Reaching the woodland I headed into the trees on an indistinct path that heads down to Bowsers Road, passing through an area that was clearly inhabited by someone. I headed to the right along the road before joining a path on the left that heads past a small caravan park and then turns to the right into a field through a tall wooden gate to run alongside a large chicken shed. The last time I had walked here the field had been full of chickens which all came running up to me as I went past, this time I assume they were all shut in their shed. The path then heads through a small apple orchard and through another tall wooden gate. 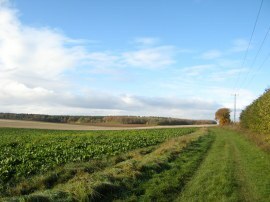 At first the path runs along the edge of the field but where this bends to the right, the footpath continues straight across the large open field, photo 27. There was no clear path across the field, nor any footprints to follow and I headed a little over to the right before the hedge line on the other side of the field came into view and I was able to pick out the low footpath marker post indicating the line of the path. The route then heads diagonally across to the corner of the next smaller field before once again setting out across the middle of another large open and trackless field. On the map the footpath heads across the field towards the village of Hadstock with another path leaving this to the right about two thirds of the way across the field. I was very pleased that I correctly judged the place where I had to head right, arriving at just the right spot where a small gap in the hedge took my through to a narrow lane. Here my route headed left for a few yards before joining a signed footpath on the right that heads down along a field edge path. Leaving the field the footpath heads past some stables on a narrow track before reaching the Bartlow Road. Here I headed to the right before continuing ahead on a track known as Chalky Road when the Bartlow Road bends sharply round to the right. 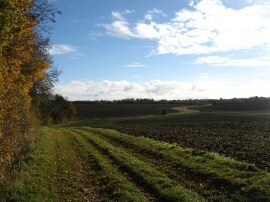 This track heads down to a field where a bridleway heads to the left along the edge of the field. 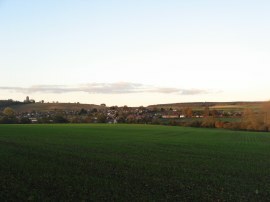 Away to my right I could see the village of Linton, photo 28, with the Rivey Hill Water Tower on the horizon behind. Ever since my lunch stop I had been conscious of a blister developing on one of my toes which suddenly burst and for a short while my foot was quite painful although this was gone by the time I reached the car. 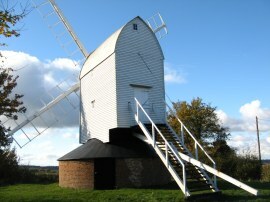 The route continues along the edge of the field, passing close by the tower of an old windmill to join a minor road. I headed along this road, past a small terrace of houses before heading to the right down a short stretch of road which leads to the A1307. Just like the morning the road was quit busy and I had another short wait until there was a space to cross. Once over the road I then headed up Mill Lane where I stopped to have a rest of my toe and eat my final sandwich before following the lane into Linton. 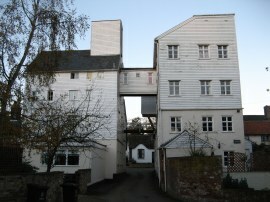 The lane crosses a small ford over the River Granta, photo 29, then bends round to pass between the buildings of Linton Mill, photo 30. I then followed the road round to the left before continuing ahead along a footpath that runs across a small recreational ground and into the churchyard of St Mary's Church, photo 31, from where it was just a short distance to where my car was parked in Church Lane. Back at the car I had walked a total distance of 18.0 miles. It was getting quite gloomy by the time I reached the car and this will probably be my last long walk of the year. It was good to have walked 10.6 miles along the path, which is the second best distance I have done. The next stage should now take me back past Newport where the two loops of the Harcamlow Way cross over each other. 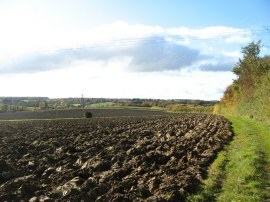 I have uploaded the route of the walk which can be accessed here Harcamlow Way 12 Route.